The authority, in a media release, says airlines under investigation are South African Airways (SAA), BA/Comair, 1Time, Mango, SA Airlink and SA Express. The announcements comes just after acting 1Time group CE Glenn Orsmond told radio station 702 Talk radio that all SA’s major airlines were profitable – in stark contrast to the global industry that expect losses of US$5.6 billion this year on the back of losses of about US$9 billion last year and US$8 billion in 2008. The competition regulator says the investigation follows a request from the Presidency (the office of President Jacob Zuma) in November to look into concerns that airlines planned to escalate their fares during the World Cup, following complaints on the matter to the presidential complaints hotline. Media reports also note that concerns are mounting that the June-July tournament will be very expensive and that this might discourage especially international soccer fans. A preliminary investigation caused state airline SAA to ask for leniency last month. It undertook to fully cooperate with the commission in exchange for reduced liability. This e-mail also suggests that airfares will have to be raised in order to cover various anticipated additional costs. Shan Ramburuth, the competition commissioner, says the World Cup tournament “provides South African business with a good opportunity to showcase our international competitiveness, an opportunity which could have positive and lasting benefits. “But it is also possible that some firms might want to exploit the situation by engaging in anti-competitive conduct. The commission is obliged to investigate all legitimate complaints in such instances,” he says. Should the airlines be found guilty, the Commission Tribunal can impose a maximum penalty equal to 10% of each company’s annual turnover from the previous financial year. The commission says it is keeping an eye on other companies that plan to make massive opportunistic profits from the World Cup. The Times newspaper this morning reports this is not the first time the commission is probing rigging in the SA airline industry. In 2006 SAA was slapped with a R55 million fine after it was found guilty on three charges of anti-competitive behaviour, including one of price-fixing with German carrier Lufthansa. 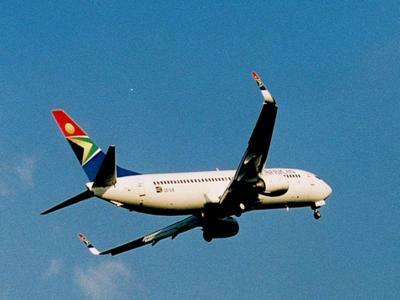 SAA, SA Express, Comair and SA Airlink were found guilty at the time of colluding to fix an identical fuel surcharge levy on tickets for both domestic and international flights. Airlink CE Rodger Foster says he is “dismayed” that his airline had been implicated. He told The Times Airlink had received an e-mail from a Comair employee allegedly offering to co-ordinate strategies ahead of the tournament, but that his firm had not responded. “We fully intend to determine our own pricing strategies for flights that will take place during the World Cup, and we will do that without any form of co-ordination with our competitors,” he said. The Business Report newspaper says the Comair email was the spark that set of the investigation. It reports the mail was sent to members of the Airline Sub-Working Group, an industry body convened by the Department of Transport to deal with air transport arrangements for the World Cup. Comair joint CE Eric Venter added that there “is absolutely no collusion in this industry.” He explained that Comair’s pricing strategy for the World Cup was a rational one. “We’ve started pricing high because we don’t know what the demand will be, we couldn’t start pricing cheaply, that would not have been rational. We could’ve held back seats until we had an idea of what the demand would be like.” Venter added that because the pricing strategy being pursued by Comair was rational all the other airlines were starting with high prices.